Holography, invented in 1947 by the Hungarian physicist Dennis Gabor, is a two-step imaging technique comprises the successful combination of interferences and diffraction. The interferences encode the amplitude and the phase information of the object wave simultaneously and the diffraction acts as a decoder which reconstructs a wave which seems to be formed from the previously illuminated object. As the etymology of the word ‘holography' suggests, a hologram contains all the necessary information of the object, holography has been widely applied in optical metrology since not only the intensity but also the optical phase and therefore the depth and contours of the object can be recovered. However, the cumbersome procedures and stringent requirements on equipment in traditional holography such as the use of photographic plates for recording, wet chemical treatment, and physically illuminating, significantly restricted its practical applications. 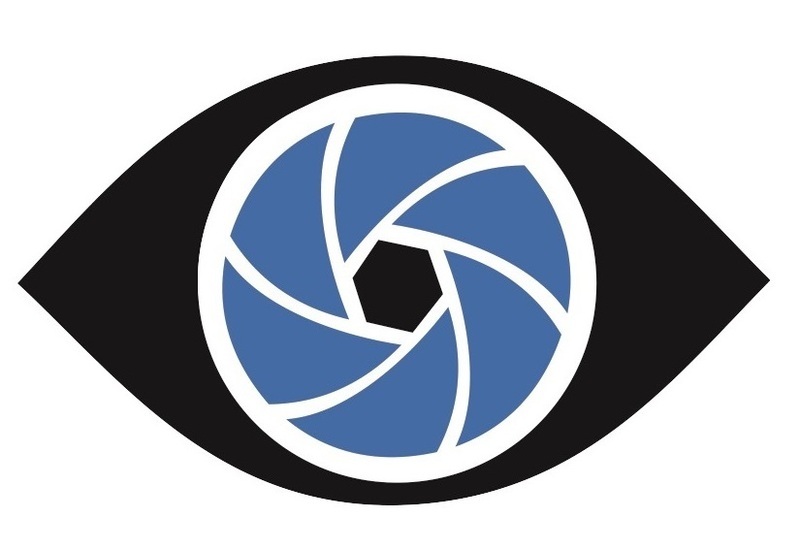 The idea of “digital holography” that to replace the analogue recording/decoding of the object with a digital recording/decoding process simulating a diffraction from the recorded image now has become a reality . In comparison with traditional holography, the main advantages of digital holography is that the hologram can be directly recorded by a digital imaging device, making chemical processing unnecessary. Besides, the intensity as well as phase information of a holographically stored wavefront can be retrieved directly and quantitatively through the numerical reconstruction process realized by a computer. Generally, the DH technique can be divided into two parts: digital recording and numerical reconstruction. 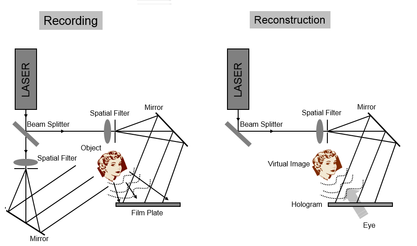 In the digital recording process, a “digital hologram” of the object is recorded using different optical configurations onto a CCD or other digital recording devices while during the numerical reconstruction process, the phase and amplitude information of the object is carried out by the digital simulation of wave diffraction in the “digital hologram”. 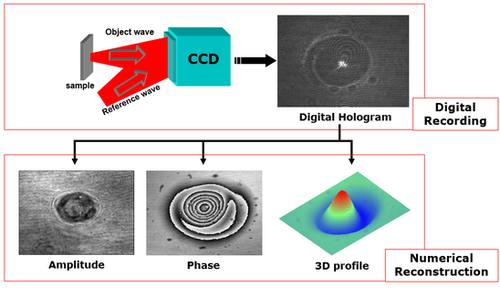 The capability of while field information storage in a hologram and the use of computer technology for fast data processing offer more flexibility in experimental configuration and significantly increase the speed of the experimental process, opening up a lot of possibilities to develop digital holography as a novel metrological tool. We are developing several practical holographic systems (so-called digital holoscope) with different optics configurations and for different applications. The compact digital holoscope (CDH) - a reflection type lens-less DH microscopic system geometry is shown on the left. A diverging laser beam from the fiber end provides the magnification in a lensless geometry. The beam is divided into two parts by using a beam splitter; one beam illuminates the sample and other incident on the plane mirror. The sample is illuminated by the diverging beam, coming from the beam splitter. 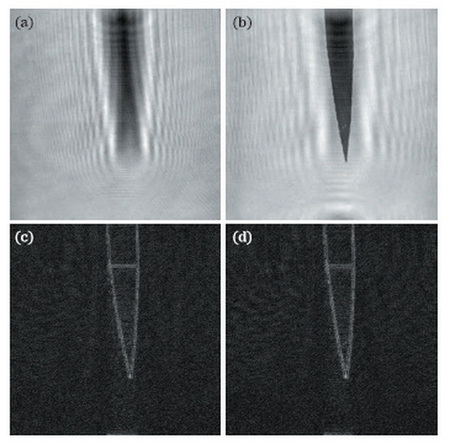 The scattered light from the sample (object beam) is combined with the other diverging beam, reflected from the mirror (reference beam) and the resulting interference pattern is recorded by the CCD. The divergence of the wave provides the geometrical magnification and thus improves the system resolution. This optical system is housed in a compact metal casing (box). The illumination source is a single mode optical fiber end which provides the diverging laser beam attached to the casing. The wavelength of the light is chosen according to the application and/or the required lateral resolution. The premise behind this configuration is to use minimum optics to optimize the aberration and make the system very light-weight, portable and compact, enabling it to be easily integrated into other systems for various types of applications. Another interesting non-conventional digital holography configuration - Common Path Digital Holoscope (CPDH) is shown on the lefe. A single diverging spherical wave passing through the microscope objective illuminate the two adjacent sides of the beam splitter with the semi-reflecting layer oriented along the optical axis with a slight tilt angle. The two halves of the beam transmit through or reflect from the opposite sides of the beam splitter’s semi-reflecting hypotenuse, and then combine and exist the beam splitter forming the interference. The sample is placed in the path of one of the half beams. This common-path configuration offers advantages of simplicity, vibration insensitivity, and inherently compensated the phase curvature. Another transmission DHM system with the Michelson interferometer configuration is shown on the left. The beam emitted from a laser is coupled into a 1× 2 single-mode fiber coupler and then split into a reference wave and the object wave. Both the object wave and reference wave are combined by the cube beam splitter, and interference occurs at the plane of a CCD camera. A microscope objective is inserted in the object arm to provides the geometrical magnification and thus improves the system lateral resolution. 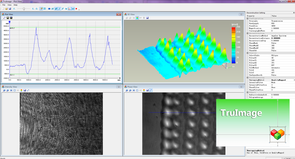 User friendly software: capture live hologram and reconstruct amplitude, phase and 3D image in real time.Quantitative Phase analysis robust unwrapping, line profile analysis, color maps.3D plot of sample and height\depth analysis.Interferometric analysis–static and dynamic. 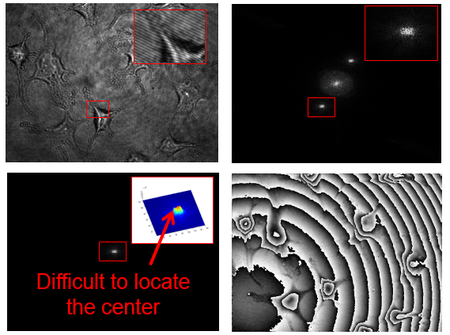 We present an effective, fast, and straightforward phase aberration compensation method in digital holographic microscopy based on principal component analysis. The proposed method decomposes the phase map into a set of values of uncorrelated variables called principal components, and then extracts the aberration terms from the first principal component obtained. It is effective, fully automatic, and does not require any prior knowledge of the object and the setup. The great performance and limited computational complexity make our approach a very attractive and promising technique for compensating phase aberration in digital holography under time-critical environments. A novel numerical algorithm is proposed to reconstruct the Laplacian of an object field from one single in-line hologram. This method uses two different reconstruction distances, or two different reconstruction wavelengths to reconstruct one digital in-line hologram. Theoretical analysis shows that when the value of difference is sufficiently small, the difference of the two reconstructed fields is an approximation to the second-order Laplacian differentiation of the object wave, and the zero-order and “twin-image” noise can be almost eliminated simultaneously. Computer numerical simulations and optical experiments are carried out to validate the effectiveness of this algorithm. 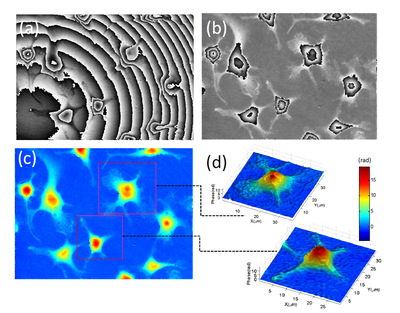 C. Zuo, Q. Chen, G. Gu, X. Sui, and J. Ren, "Laplacian reconstruction of one single hologram using two different reconstruction distances or wavelengths," Chin Opt Lett 10, S10901 (2012).